In the Eastern Cape, a schoolgirl maths prodigy is haunted by the loss of her mother, who disappeared during the demise of the country’s homeland system. When a strange apparition – “the machine” – visits the girl at night, she’s convinced it’s a sign from her mother, and connected to a series of abductions of local girls. With her two closest friends, she sets out to find the truth, exposing links to the area’s murky past. Are her visions disturbed hallucinations to be medicated away? Or are they evidence of supernatural – perhaps even extraterrestrial – contact? Years later, as a gifted data scientist in a dystopic surveillance-state, she is drawn into a world of espionage, shadowy corporations, eco-terrorists and hackers through the love she feels for an elusive artist. 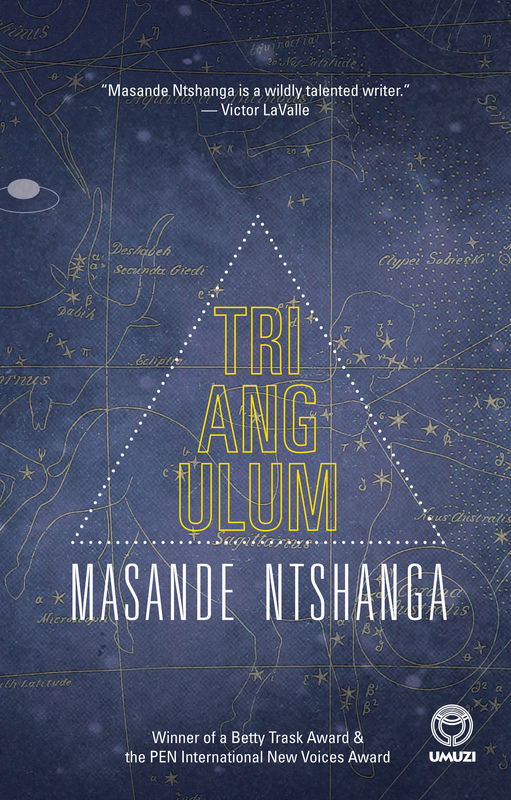 Presented as a message from the future, Masande Ntshanga’s Triangulum boldly mixes science-fiction with philosophy and details of South African history seldom examined. An affecting exploration of bereavement, sexuality and coming of age, this multilayered novel showcases a completely original talent coming into his full powers. Masande Ntshanga is the Caine Prize-nominated winner of the 2013 PEN International New Voices Award. He was born in East London in 1986 and graduated with a degree in Film and Media and an Honours degree in English Studies from UCT, where he became a creative writing fellow, completing his master’s in creative writing under the Mellon Mays Foundation. He has received a Fulbright Award and an NRF freestanding master’s scholarship and a Civitella Ranieri fellowship, and was selected as the Africa Centre’s 2015 Artist In Residence at the Bundanon Trust in Australia. His stories have appeared in Laugh It Off, ITCH, Imago and Habitat. The Reactive was shortlisted for the 2015 Barry Ronge Fiction Prize and the University of Johannesburg Debut Prize.